For ex. in DG Tournament I use the onload event to enable Google Suggest. However, when you try to put the above code as HTML Body Attribute, you may get the error "You may not declaratively set cursor focus if you specify an ONLOAD in this attribute." You can fix this error by go to the Display Attributes of your Page and set the Cursor Focus to "Do not focus cursor" instead of that APEX puts the focus to the first item of the page. APEX - Why limiting a column to 22 characters? For a tabular form your Primary Key Column can't be more than 22 characters long. I wonder why the APEX development team didn't limit that length to 30 characters, as it is in the Oracle database? To make it even more strange, for a "normal" form your primary key column can exceed the 22 characters limit! 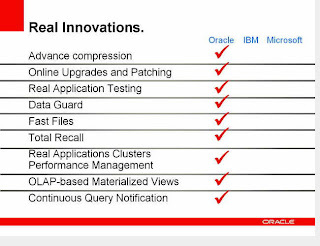 During the Oracle 11g webcast I took some notes and screenshots, which I posted below. 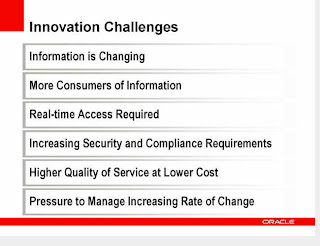 A big portion of this webcast was about "Innovation" and "Managing Information". Charles Philips stated only 3% of the world has been digitized. He thinks the biggest challenges for customers are the way to manage more and more complex data. Where 10g was about "Grid", 11g is about "Scaling Grid". The next slide I find interesting too... 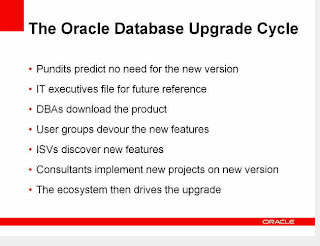 When and why would customers upgrade their database? The press release of the Oracle Database 11g you find here. More technical information about 11g you find on OTN. 3 minutes before the 11g release of Oracle! I'm ready for the 11g Oracle Database launch! 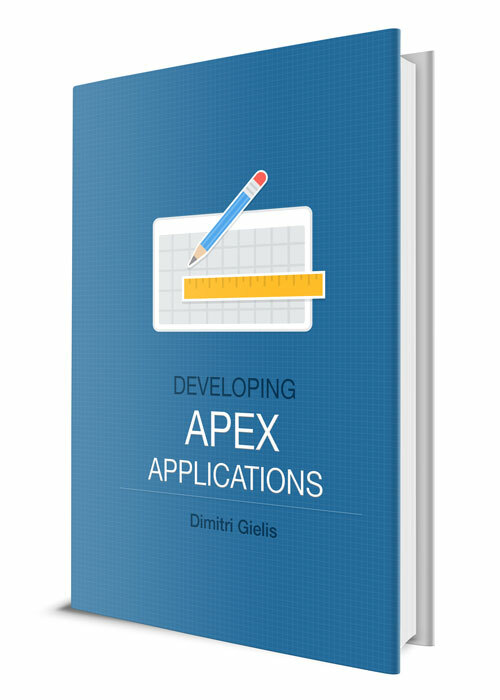 Scott Spadafore, Oracle ACE and one of the developers of APEX, especially in the security area, explained what happened when you click the logout link in your Oracle APEX application. The built-in item LOGOUT_URL gives you access to the logout URL attribute of the current authentication scheme. In referencing it as &LOGOUT_URL. or v('LOGOUT_URL'), or as a bind variable, the resulting attribute will have had basic substitutions performed on it first, e.g., for &APP_ID. and &APP_SESSION., facilitating its typical use as the target of a Navigation Bar Entry. If you hover over this link in your application, you'll see that it's a full URL (host:port/pls/DAD/...) with substitutions completed and that the result of using the link is to execute the wwv_flow_custom_auth_std.logout procedure through modplsql. What does the logout procedure do? Unsets your application's session cookie (actually sets it to '-1') and 2) redirects to the after-logout page. How does it know what cookie to unset? ...The cookie name is also an attribute of the curent application's authentication scheme so it looks it up. How does it know what the current application is since the logout procedure is not run in a "page request context"? ...The current application ID is a input parameter to the logout procedure (&p_this_flow=&APP_ID.). How does it know what page to show after logout? ...That's the other input to the logout procedure (&p_next_flow_page_sess=&APP_ID:1 where the application and page to redirect to are both given). But it looks like it goes to page 101 (login page) after logout. ...Yes, but the instructions were to redirect to page 1 after logout and if page 1 requires authentication, you have to login first. After login, you'll go to page 1. How to create a custom logout procedure or call some DML during the logout operation? 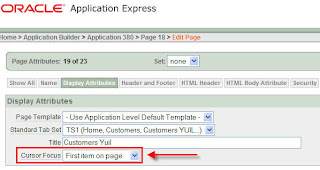 On page 99 create a before-header process to call your DML procedure (or do the DML in the page process directly). 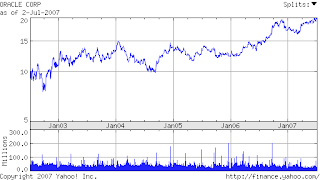 Also having Oracle stock options? For the first time in years Oracle passed the "20"-bounder! The reason behind that is probably the SAP (TomorrowNow) fight. More info in this article?